This powerful PS544 Pneumatic Panel Saw has no equal. 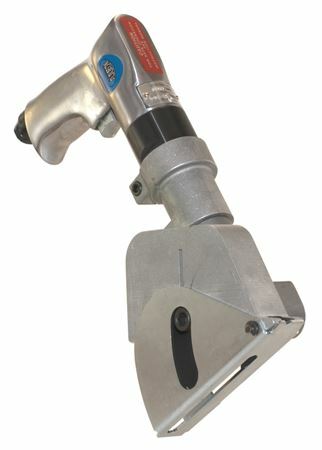 For cutting drywall, plywood , laminate, hardboard or other soft or rigid materials up to 1-1/16" thick, It features a cast aluminum saw head 3-1/2" hardened high-speed saw blades protected by a spring-loaded retractable blade guard. This controlled depth-of-cut also makes it ideal for cutting signs, PVC, acrylic plastics and C.R. mild steel up to 16 gauge. Weighing only 5 lbs. and at 14 inches long, it lets you work in tight spaces without hand or arm fatigue. 90 PSI pistol grip, variable speed, 2200 RPM motor. Replaceable tool steel saw blades. Cuts plastic and other rigid materials up to 1-1/6” and aluminum to 1/8”. Great for cutting plywood, siding and backer board. Leaves a milled, ready to fabricate finish without burning the material. Plunge cuts into the middle of the material.